Blackjack oaks are a small variety of oak tree that can be found growing wild throughout a significant portion of the woodlands of the eastern U.S. These trees are fairly hardy and thrive in soil that is too poor for other trees. Although adaptable to a variety of soil conditions, the blackjack oak is quite susceptible to disease. 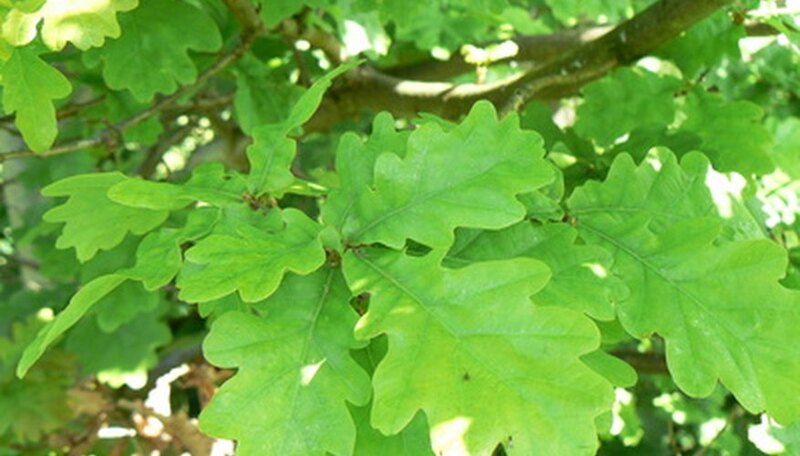 Oak wilt is caused by a fungus that is either transmitted by beetles feeding on the tree or from one tree to another through their root systems. The blackjack oak is particularly susceptible to the disease. Oak wilt is almost always fatal in blackjack oaks and they can die in as soon as one month. When oak wilt first strikes, leaves slowly turn yellow, wilted or water logged. These leaves eventually drop. As the disease progresses, fungal mats appear on the bark. But by the time these symptoms are noticed, it is too late to save the tree. The best solution is to uproot the tree and plant a disease-resistant cultivar. Canker is caused by a fungus that forms mats under the bark of blackjack oak trees. Tree owners often first notice the bark accumulated at the bottom of the tree as the fungal mats push sections of it out. Canker is often seen as a beneficial blackjack oak tree disease. It affects the excess blackjack tree population allowing surviving trees more access to resources. Blackjack oak trees affected with bacterial wetwood ooze a brown, foul-smelling liquid from cracks or wounds in the wood. When the ooze dries, it leaves behind a light-colored crust on the bark. There is no cure for bacterial wetwood, but trees seldom die from the condition. As the bacteria consume the tree, they raise the pH of its interior, which actually preserves the wood. When oak leaf blister first strikes, owners often notice that their blackjack oak trees' leaves that are slightly yellowed and blistered. As the disease progresses, the bottom of the leaves turn gray and the leaves eventually drop. Oak leaf blister is not a serious disease. Control the spread of the infection by pruning affected foliage. Shoestring root rot is easily identified by the clusters of tan or yellow mushrooms that form at the foot of infected trees. If you lift up the bark of an infected blackjack oak you will see the black shoestring fungus and the underlying wood will look white and rotten. There is no cure for shoestring root rot. Infected plants should be uprooted and the soil sterilized before another blackjack oak is planted. Why Are My Trees Oozing Sap?